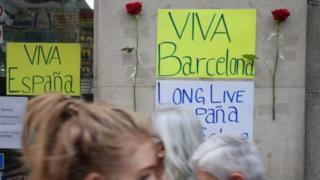 Image example People put signs wey say "Long live Spain" and "Long live Barcelona" for wall for Las Ramblas, the area where one terror attack happen. Special police control go dey today for Barcelona first match since two terrorist attacks for Catalonia kill at least 13 people, with about 120 others wey get injury. Dis one dey happen as Spain interior minister say di country terror alert go remain for level four, because dis na the deadliest attack wey don happen inside the country since the last 13 years. Barca go open their season campaign with match against Real Betis; dem go host Real for Camp Nou. Na up to 100,000 fans na im suppose attend the match, and everybodi go observe one minute silence to honour those wey die. Authorities don say make people people cool their mind, go enjoy the game. For Saturday, na concrete road blocks dem put outside Girona arena wey be Estadi Montilivi; the club first ever La Liga match against Atletico Madrid happen safely, in front of about 13,500 fans wey come show support. Dis morning, King Felipe and Queen Letizia of Spain dey attend mass for Sagrada Familia; the ceremony na to mourn the victims wey die. Police still dey find the person wey drive the van wey kill people for Las Ramblas, Barcelona. Barcelona city na the capital of Spain Catalonia region, and the Catalan Interior Minster wey be Joaquim Forn don say the police operation never finish, until all those wey join hand commit the attack dey inside cell, or jail.